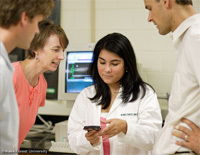 Collaborate with the graduate program in Molecular Medicine and Translational Sciences at WFU Health Sciences to expand training in translational science. Furthermore, the center has created an outreach component within the education core that aims to offer a summer program in translational science for Winston-Salem State University, Salem College and WFU students, and hold seminars of general interest in translational health. The Molecular Medicine and Translational Science graduate program is one of the first of its kind that focuses on training students to conduct research that they can translate into treatment of human disease. The core faculty of the TSC will be integrated into the graduate program to expand graduate education in translational science in general, and in particular, on the Arts and Sciences (Reynolda) campus. To further enhance the graduate program, the TSC is looking at ways to open translational training opportunities and experiences to outstanding graduate students in all PhD science programs, and train translational science faculty in each area of focus. Interdisciplinary training, beginning at the undergraduate level, will provide the next generation of scientists with the skills needed to effectively carry out translational research. Students with career aspirations in both the basic and applied sciences, have expressed interest in obtaining more training and knowledge in translational sciences. Surveys reveal that students recognize the uniqueness and importance of obtaining this knowledge as undergraduates to make them more competitive for graduate and professional schools. For the proposed future translational science minor, students will take a minimum of 17 hours of credit, including one newly-developed course, Introduction in Translational Science, and at least one semester of translational research with a faculty member of the center. For this introductory course, center faculty teach a one-week lesson once a semester, with topics rotating week-to-week based on the faculty member’s specialty in that area such as clinical, bench-top, or community-based research. In addition, students will be required to take a minimum of four other established courses in the science disciplines, which may include classes in education programs at Wake Forest University Health Sciences. At least one of these four courses would be outside of their major requirements.